Built-in cushion for neck and back support. Most parents as well as their friends and relatives are reluctant to hold newborn babies because they are scared they might injure them. BundleBee Baby Wrap solves this problem with the built-in removable cushion that protects a newborn’s fragile neck and back. The cushion also allows mom to lay her baby down on uneven surfaces. This makes the BundleBee Baby Wrap very handy when visiting places where a crib or a cradle is not available. 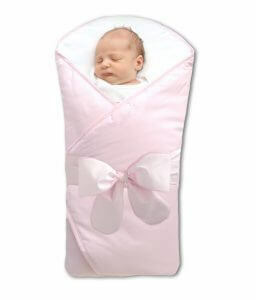 BundleBeeBaby Wraps is roomy enough to allow for natural hip movement which reduces the risk of hip displacement. Besides, new babies start to move around after 2 or 3 weeks and the BundleBee baby wrap lets them wiggle a bit while the down-like blanket swaddles around them still keeping them nice and cozy. Our BundleBee baby wraps are made from high-quality cotton fabrics meeting highest standards of Hohenstein Institute, one of the most important independent research and testing institutions in the textile sector. The standard (OkoTex 100 Class 1) ensures that our products will not cause any redness, chafing or allergic reactions on the delicate baby’s skin. The cool cotton fabric feels great to little one’s skin. It keeps her warm during the winter but will not cause overheating in the summer and will stay cool and comfortable. 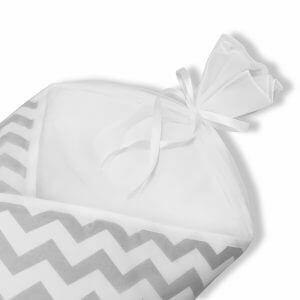 Each BundleBee baby blanket is filled with down-like padding with carefully chosen thickness and softness. Feather-light filling is made from high-quality polyester fibers formulated specifically for the type of cotton fabric surrounding it so that no fibers come through. Our filling is especially recommended for allergy-prone babies. It does not contain any genetically modified plant substances or composites. The lining is sewn in a particular quilt-type pattern which prevents shifting and formation of so called “cold spots”. The built-in cushion is made from all natural, biodegradable coconut fiber, a material best known for its natural ability to breathe and is the latest innovation in mattress and pillow industry. Coconut fibers allow proper air circulation, absorb moisture and offer the required support for back and neck. Coconut fibers are also known for their firmness and elasticity. 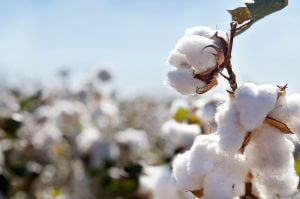 Unlike other fibers, they are also burn resistant and resistant to development of odors. In addition, coconut trees are grown and owned by poor farmers in third-world countries, mostly in poor coastal regions like Philippines, Indonesia and Brazil. The increasing use of coconut in developed industries helps support those poor regions through increased demand which can lead to more revenue for the farmers who today, make less than $2 per day. Read more about coconut Baylor University research on coconut, it’s amazing qualities and applications. I f you know how to fold a burrito, you can swaddle a newborn with our BundleBee wrap. It’s simple. Fold the bottom up and then fold each side over. Align the Velcro and it’s done in 10 seconds tops. Velcro lets you adjust the size of the BundleBee. There is no more excuse for new dads not to change that diaper! Swaddling the little one back up is no task at all. BundleBee Baby Wrap makes a beautiful and unique baby shower gift. It is practical and yet beautiful and is a must-have item for any new parent. Our beautiful tulle satchel creates very attractive packaging so that you can make a statement when gifting a BundleBee.